Remote control sailboat measures about 34" high and is extremely realistic and detailed. This sailboat might as well have been built by hand. ON SUPER SALE TODAY. 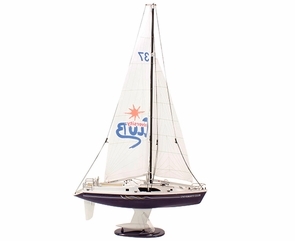 Enjoy the wind today with your new R/C sailboat. Whether you can afford a real sailing yacht or not makes no difference as now everyone can sail for a great price! Up to 100 RC sailboats can be raced at one time thanks to 2.4ghz long range transmitter with automatic frequency hopping technology. Range is about 1000 feet. Still want more? Comes with everything you need and almost completely assembled. This item is oversized and the shipping rates are a little higher due to the dimensions of the box. RC sailboats are huge. Construction: Extremely strong deck and hull, injection molded masthead and sail line boom supports, aluminum mast and boom, low drag keel and boom disconnect for easy transporting. Hull Features: Raised cabin area with railings, rigging cleats, raised steering wheel, and other details. Sails: Rip-stop nylon with trim scheme applied Rigging: All lines and cleats numbered for fast and easy hookup out of the box Radio:2-stick sailboat radio made by Futaba provides rudder and sail control, receiver and servos are pre-installed in hatch, radio system features servo reversing, and battery status LED. Display Stand: Elliptical shaped with hardened supports, pre-finished wooden base and rubber sections where hull rests. Warranty: manufacturer 90 day limited. See related categories of RC boats, RC sailboats, and water toys for sale. I like this boat because of the low price but it has a lot of functions. My son loves it. Twin motors power the remote control sailboat as well as the wind. No more getting stuck in the middle of the water without wind!